If you’re a big Florida Gators fan, chances are you’ve been to Ben Hill Griffin Stadium for a game or two. Also known as “The Swamp,” this football stadium is located in the heart of Gainesville, on UF’s campus, and boasts a capacity of nearly 90,000. Don your best blue and orange attire and attend an overwhelmingly passionate game. Whether you’re a loyal fan or just curious about what all the fuss is about, you’re in for quite the ride. Spend the early afternoon tailgating outside the stadium or arrive just in time for kickoff. Once you’re seated, sit back with a cold beer and maybe some fresh food and enjoy the game! 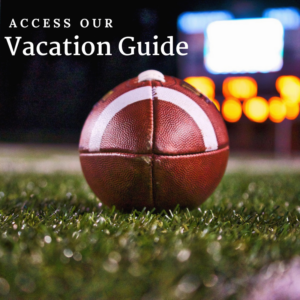 For more ideas on where to go and what to see in Gainesville, access our free vacation guide! The original stadium, which currently comprises the lower half of the facility, only seated 21,769 people. In the 1950s, seating capacity doubled to over 40,000. After many renovations, the stadium now holds 88,548 people though the stadium has held over 90,000 for home games! The University of Florida fielded their first official football team the same year the school was established, in 1906. The original stadium opened in time for the 1911 Football season. The famous Steve Spurrier nicknamed the stadium “The Swamp” in 1992. Known for the region’s heat and humidity, “The Swamp,” is known for being a difficult place for opposing teams to play. The playing surface is below ground level. Florida Gators fans remain loyal, and home games sell out on a regular basis. Because of the large fan-base, this stadium is known as one of the loudest in the United States. The stadium’s facade features the years in which the team won the Southeastern Conference: 1996, 2006, and 2008. You can also see a tribute to the team’s three Heisman Trophy winners: Steve Spurrier, Danny Wuerffel, and Tim Tebow. The marching band, the “Pride of the Sunshine,” plays the UF fight song after every Gator score. Flag down Albert and Alberta, the team’s Gator mascots, for a photo! A short video plays of intimidating, live alligators every game when the team takes the field. At the end of the third quarter, the “Pride of the Sunshine” plays “We are the Boys from Old Florida” while fans sway and sing along. Join us back at the Sweetwater Branch Inn to celebrate a tremendous win at the Ben Hill Griffin Stadium. We’re big Gator fans and love to house fans who come to town for a game. You can even host your own personal, Gator-themed event with us! Centrally located yet tucked away from the hustle and bustle, you’ll find so much to see and do near our property. It’s the perfect place to rest your head after a rousing game! 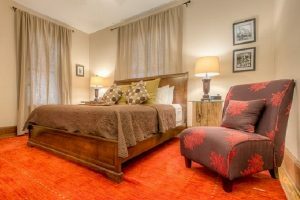 Choose to stay in a room in the Cushman House, the McKenzie House, or just book a stay in one of our spacious cottages! Perfect for an extended stay, the newly renovated, Nora Belle’s Cottage boasts two bedrooms, a wraparound front porch, and a shared living room area. Large enough to sleep six people, you’ll have plenty of space for the family or a few friends!